There has been an ongoing controversy over which alarm system is the best for installing in homes and for once, we at Serious Security have taken a neutral stance. We do this on premise that both systems are practically identical except that one requires wiring with the other needs no wiring attached for it to function properly. For all intents and purposes, though the external construction may be different for both systems, the internal components are almost identical give or take their positioning within the framework of the system and the choice is yours to make. How reliable are the two systems? There is little doubt that each alarm system is equipped with functioning components that feature the control panel, movement detectors, sirens, the code pad, the battery (for the wireless version) and remote controls. With our expertise, we can put these components into efficient working parts that will put the alarm system into motion once it is activated. The motion detectors will pass messages to the control panel which will in turn trigger off the system. The code pad stands by to warn and point to a detector that has failed to send messages to the control panel. Why go for the wireless system? There is always a good reason for deciding in favour of or against something and this is the same for our wireless and wired alarm systems. A wireless alarm system is easier to handle and move around in any low or high story building but it is better suited to a multi-storied house. Another plus for the wireless system is that there is no need to make changes to the structure or flooring of the house by making holes or cavities in the ceiling for accommodating the wiring for the wired alarm system. Technologically however, there is no real difference between the two systems. What of the wired alarm system? Ideally, the wired system is more at home in a contemporary-style single story house but this is not to say the hardwired system works better than the wireless version from a single storied building. Because the wired system is connected to the electricity grid, its power is assured without the need to replace anything. With the wireless version, the user must periodically replace the batteries which run out of power every 5 years or so. In another sense, a wired system is more difficult to handle when you decide to locate to another location and sell your home. With a wireless system, relocation is not an issue. You simply unpluck it and stick it back up on the new house. 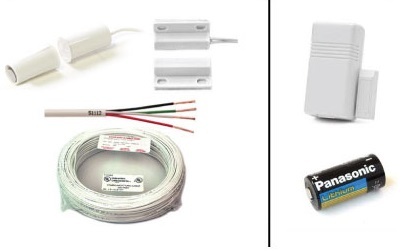 We have all the different types of wired and wireless alarm systems in stock. If you want one installed, just ring us on (02) 8734 3250 for a free quote and we will do the job for you.